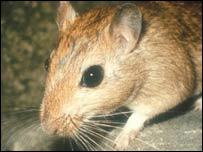 People who keep rodents as pets should take care not to catch salmonella, experts advise. The American Centers for Disease Control has reports of 28 people, including seven young children, who have caught strains of the bacteria carried by pet rats, mice and hamsters. Not washing your hands after handling these animals puts you at risk of the infection, say experts. Snakes, turtles and hedgehogs have also been linked to human outbreaks. Gerbils, rabbits, guinea pigs and ferrets can also carry the germ in their guts. Salmonella poisoning usually occurs from eating contaminated food such as meat and eggs. But the CDC discovered a number of human infections had come from animals kept as pets. Dr. Stephen Swanson, a CDC epidemiologist who helped investigate the outbreaks, said parents should monitor their children's exposure to rodents and other such pets and ensure they wash their hands after contact. One of the children who contracted salmonella was a five-year-old boy from Minnesota, who had frequently handled and kissed a pet mouse that was visibly ill.
A spokesman from the UK Health Protection Agency said: "Salmonella caught from pets/companion animals is well-documented, and we see cases occasionally. "The advice for those keeping reptiles as pets is make sure that young children do not touch the reptiles, or that if they do they are closely supervised. In particular, they should not put their fingers in their mouths after touching the reptile. "Wash your hands immediately after touching the reptile. Also, bear in mind that the reptile may contaminate items in its cage, so handle these with care as well, and wash your hands after touching them. "Keep reptiles away from food preparation areas and do not let reptiles roam freely throughout the house or living area."